There are no computerized machines to guide the woodworking process in Chase Gullett’s guitar-making shop in Ostrander. Everything he creates is guided by his own hand. 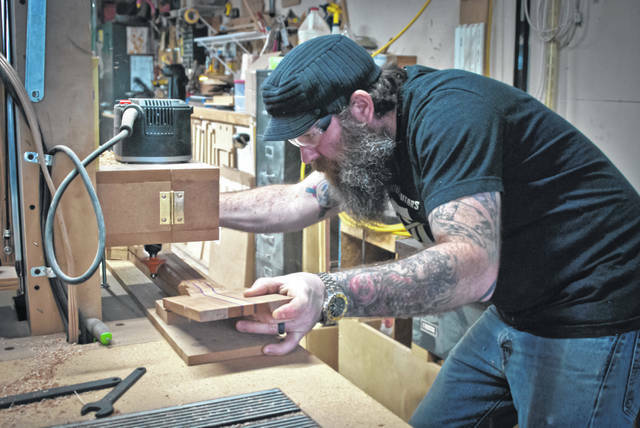 In fact, Gullett built several of the router tables and jigs he uses to shape the body and necks of his guitars. Chase Gullett, a 20-year woodworking veteran turned traditional luthier, sold off his two hot rods and a vintage Gibson guitar in 2015 to invest in his dream — Chasing Vintage Guitars. 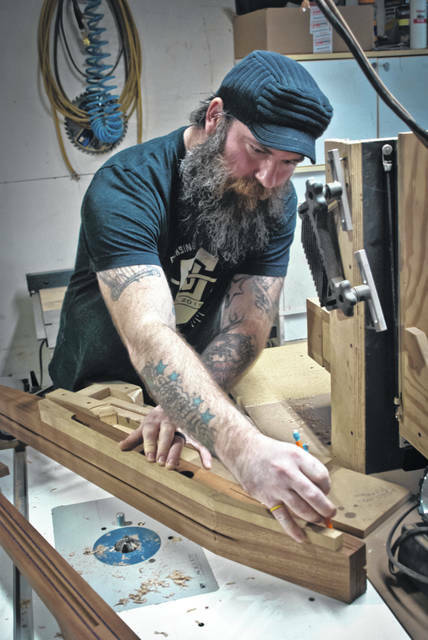 Creating custom guitars in his garage converted into a wood shop in Ostrander, Gullett hopes to revitalize the Delaware area music community. Every guitar body starts with a template that hangs on the wall of Gullett’s shop, but his creativity isn’t limited to the template. As he works with the wood, the small details are added to make each client’s guitar unique and special either through the type of wood, the subtleties of the carving, or the materials chosen for the inlays on the body and neck. Gullett said since wood expands and contracts along the grain line, he orients the grain in a fretboard so it remains stable through humidity and temperature changes. He shows how this is done in the photo with a neck that he has started to assemble to create a blank to work from. Using templates of his own design, Chase Gullett marks out a neck on a blank piece of stock that he has prepared from woods that he hand selected at the mill. 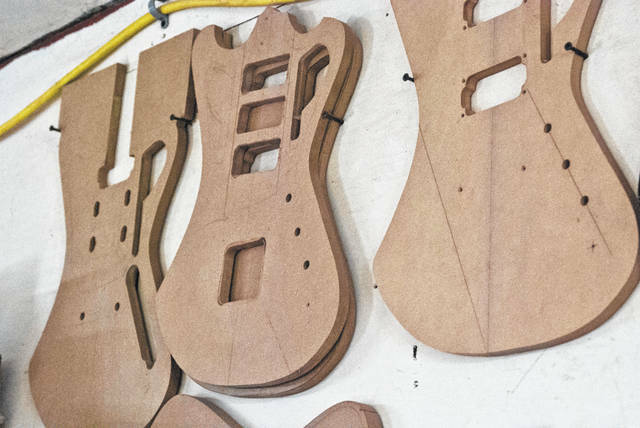 Chase Gullett’s vision isn’t just centered on building a custom design guitar business — he wants to create a Delaware area music community. Gullett, a 20-year woodworking veteran turned traditional luthier, sold off his two hot rods and a vintage Gibson guitar in 2015 to invest in his dream — Chasing Vintage Guitars. “Those were tough times just keeping the lights on,” he said. Gullett is one of two certified Taylor Guitar craftsman in central Ohio, and one of 11 in the state. 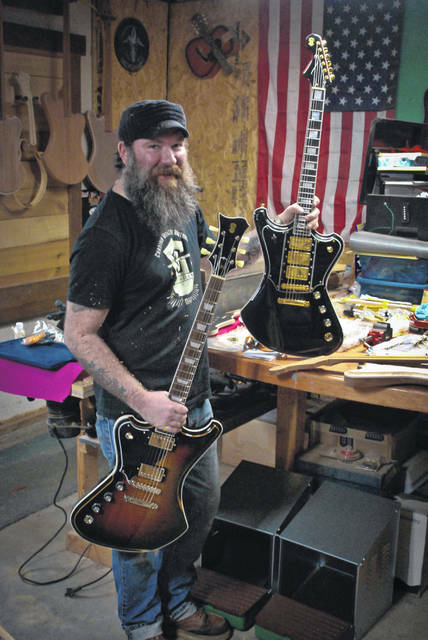 He currently builds his guitars in his small woodworking shop in Ostrander. Gullett handpicks raw woods from the mill to create original, solid-body electric guitar designs using mahogany, purple heart, rosewood, ebony, curly maple, and abalone woods. He uses a variety of seashells, mother of pearl, and brass inlays to customize his custom-ordered works of craftsmanship and art. Gullett said some of his designs have included Viking ruins, constellations to create an interstellar look, a family’s zodiac signs, and LED lights running along the side of the fretboard to give the guitarist a quick, clear view on a dark stage. 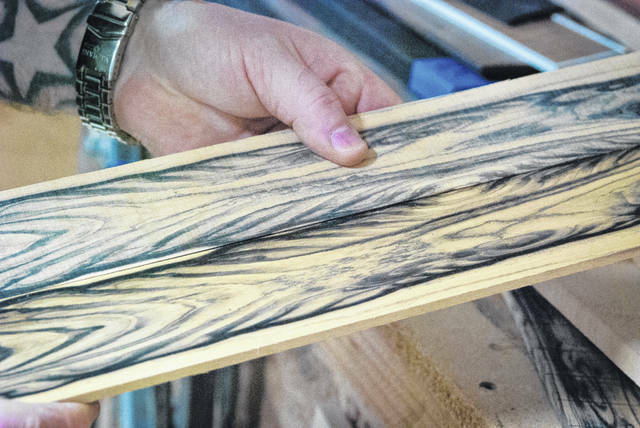 Gullett said since wood expands and contracts along the grain line, he orients it so the fretboard remains stable through humidity and temperature changes. Gullett said he started playing guitar when he was 15 years old on a guitar from the pawn shop. He leaned toward guitars mostly because of his father’s influence of listening to rock and roll music. Gullett said he played in various bands in high school and while in his 20s, but now he wants to give others a chance to experience playing the music that moves them. He said in recent years, there has been a lag in the music community due to the tech age, but he wants to try to get it started again. Gullett added there is a catch-22 to the revitalization, however. He said on average, there are two million guitars sold every year with a majority of the purchases coming from online factory dealers. Gullett said before the internet, music stores took an instrument to the backroom to be set up before it was put on the showroom floor or into the hands of a customer. Gullett wants to include everyone, so he’s designed guitars for the traditional right-hand player and the “southpaw” left-hand player as well. Jay Shuter, a client and a friend of Gullett, agrees that the Delaware area is an art community. Shuter said he has bought his share of poorly sounding guitars from online shops. “My experience here is you’re only as good as the tools you work with,” he said. Gullett said his business has doubled every year, but he has reached his saturation point of building 25 guitars a year. He said people don’t want to buy a guitar built by someone he had supervised. Gullett said he currently does guitar repair, but it has been more word of mouth among the local musicians. This entry was tagged Chase Gullett, Chasing Vintage Guitars, Custom Guitars, D. Anthony Botkin, Guitars, Ostrander. Bookmark the permalink.